D. SC.PhD, Professor Eduard Vladimirovich Spolsky. He headed the Department of theoretical physics of MSU from 1939 to 1972. Honored scientist of the RSFSR, laureate of the state prize of the USSR, order of Lenin (1953), a gold medal. S. I. Vavilov of the USSR (1962), order of the red banner of Labour (1972). The author of the discovery of the unique physical effect, the author of the fundamental book “Atomic physics”. Chief editor of journals “advances of physical Sciences” and “Physics”. Shpolsky studied at the department of physics of Moscow State University. In the aftermath of the Casso affair of 1911 professors of physics Pyotr Lazarev and Pyotr Lebedev and their assistant Sergey Vavilov resigned and joined the faculty of the fledgling private Shanyavsky University. Shpolsky followed them, remaining de jure a student of Moscow State, and made his first research assignment in Lazarev’s private laboratory in Arbat District. He graduated from the department of physics of Moscow State University in 1913 and joined the staff of Shanyavsky University. In 1918 he returned to Moscow State University and lectured there until 1939. 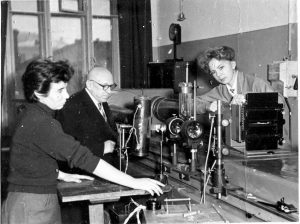 In 1932 he also joined the faculty of Moscow State Pedagogical Institute and chaired its department of physics for 46 years. He received the doctorate at MSU in 1933. 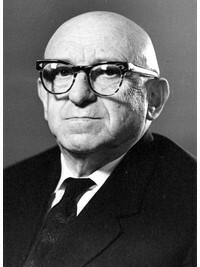 After World War II Shpolsky engaged in physical studies of carcinogens. He reasoned that carcinogens should possess physical properties distinct from harmless substances, and although no such link was ever found, his studies led to the discovery of Shpolsky effect. In 1952 Shpolsky, Ilyina and Klimov published an article in Doklady Akademii Nauk asserting that complex organic substances that normally do not have clearly defined spectral lines do, in fact, emit or absorb them at low temperatures when mixed with specific organic solvents. Use of the solvent, forming a snow-like paraffin structure at 77 K, was a radical departure from an established spectroscopy routine. In the same year Pyotr Kapitsa provided Shpolsky his laboratory to repeat the experiment at lower temperatures. This property became known as Shpolsky effect; Soviet authorities formally recognized it as a discovery only after Shpolsky’s death. Organic compounds possessing this effect became known as Shpolsky matrixes and Shpolsky systems. The method, although lacking solid theoretical foundation, provided extreme spectral selectivity and became a major improvement in detecting 3,4-benzapyrene in the 1960s. In 1961 Karl Rebane suggested that Shpolsky effect was an optical analogy to Mössbauer effect (see zero-phonon line and phonon sideband). 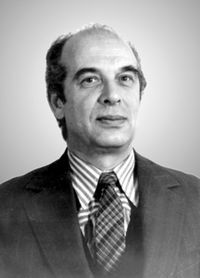 Roman Personov, an alumnus of Shpolsky laboratory, confirmed Karl Rebane hypothesis in 1971. Later studies showed that matrix isolation fluorimetry has significant practical advantages over original Shpolsky methode. Roman Ivanovich Personov was born and raised in Moscow. He received a higher education at the Faculty of Physics and Mathematics of the Lenin Moscow State Pedagogical Institute (MSPI), from which he graduated with honors in 1955. After graduating from this institute, he stayed there for postgraduate studies at the Chair of Theoretical Physics. In 1955–1956, Personov served in the Soviet Army, then continuing his postgraduate studies. In 1959, after graduating from the postgraduate course, he received an offer to become an assistant at the Chair of Theoretical Physics at MSPI. 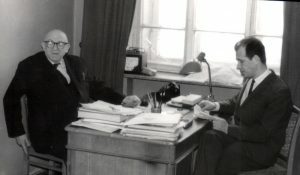 His scientific supervisor was the outstanding Soviet physicist Prof. E.V. 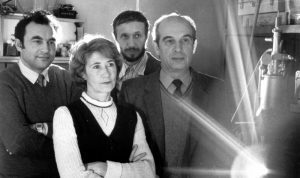 Shpolskii, who shortly before had discovered an effect consisting of the appearance of a fine structure in low-temperature luminescence and absorption spectra (quasi-line spectra) of some complex organic compounds in specially chosen matrices. Personov’s candidate’s dissertation was devoted to further investigation of the nature of quasi-line spectra. His task was to study the fine-structure spectra of a number of compounds belonging to the class of aromatic hydrocarbons and porphyrins and to develop methods for qualitative and quantitative analysis of such compounds on the basis of their quasi-line fluorescence spectra. Personov coped brilliantly with this task and, in 1963, successfully defended his dissertation for the degree of candidate of science in physics and mathematics. It is important to note that, within the framework of his dissertation, Personov devised and put into practice a method for identification and quantitative analysis in food products and other media of such a potent carcinogen as 3,4-benzpyrene. This technique is still used successfully at present. Personov’s educational activities were also successful. In 1964, he was appointed associate professor at the Chair of Theoretical Physics. He lectured on classical and quantum mechanics and gave practical training to students on different branches of theoretical physics. Personov’s lectures were always profound and were celebrated for their clarity of presentation. The studies carried out in those years by Personov with his students were devoted to investigation of luminescence and absorption spectra of biologically important compounds of the class of porphyrins and to elucidation of the nature of the narrow lines and multiplets observed in quasi-line spectra. In particular, for a number of impurity organic systems, the temperature broadening and the shift of zero-phonon lines were studied in detail for the first time, with the relative contribution to the phonon wing from transitions with the creation of a different number of phonons being estimated. 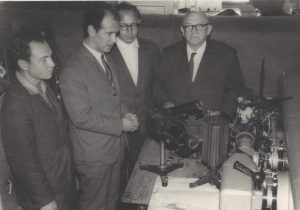 At the time, Personov was interested in new possibilities offered by lasers for the luminescence excitation of solutions of complex organic compounds. The effect of reversible transformations of luminescing impurity centers under laser excitation in the range of the electronic transition of an impurity was revealed. Personov was an outstanding teacher. 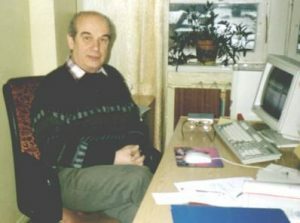 For nearly 30 years, he delivered lectures on molecular spectroscopy at the Chair of Quantum Optics at the Moscow Institute of Physics and Technology. In the opinion of listeners, Personov was a brilliant lecturer, capable of presenting material comprehensibly and with maximum clarity. He always prepared his lectures with the utmost care, polishing them to perfection. His high professionalism as a teacher was also recognized abroad. Personov was invited to many universities and research institutes throughout the world to give lectures on molecular spectroscopy and site selection laser spectroscopy. 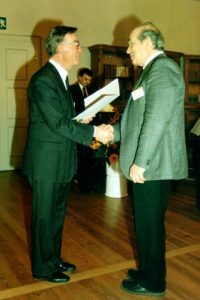 For his decisive contribution to the formation and development of site selection spectroscopy of impurity molecular systems, Professor Personov was awarded the State Prize of the USSR (1986) and the Alexander von Humboldt Prize (Germany, 1995).